Cheong Wa Dae has been at the center of Korea’s modern history, from Japan’s colonial rule, through a succession of dictatorships and to the grueling struggles for industrialization and democratization. The site for today’s presidential complex in central Seoul was once occupied by Japan’s colonial governor and then by the U.S. military administrator before South Korea’s first president, Syngman Rhee, took it for his official residence in 1948. Its history dates back to the Goryeo Dynasty (918-1392) during which King Sukjong set up his secondary palace on the site. During the ensuing Joseon Dynasty (1392-1910), the royal villa turned into a backyard of Gyeongbok Palace, which was established in 1395 as the residence for King Taejo, the founder of Joseon. 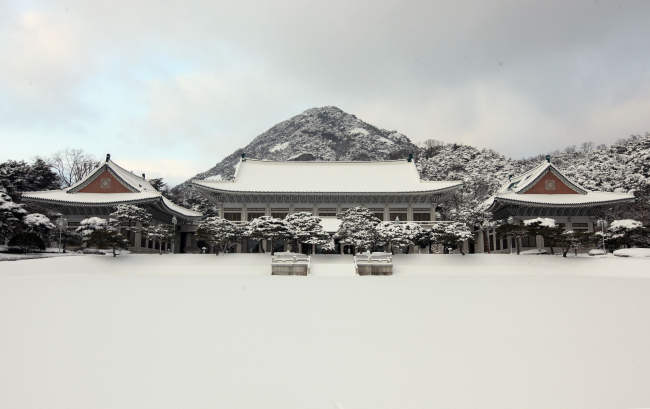 As King Gojong renovated the site in 1868, he built a series of state facilities, including those for administering national exams and practicing martial arts. During the dark period of Japan’s colonial occupation from 1910-45, the Japanese Government General of Korea occupied the palace. The colonial governor used the current Cheong Wa Dae site for his official residence. Following the country’s liberation in August 1945, U.S. military governor Lieut. Gen. John Reed Hodge lived in the site for a little more than two years as he led the U.S. forces to disarm Japanese troops and help establish the government system south of the 38th Parallel, a line drawn by the U.S. and the Soviet Union. After the Republic of Korea was founded in 1948, President Rhee set up his office and residence in the site. He named it “Gyeongmudae.” The name is a compound word with “Gyeong” from Gyeongbokgung Palace and “Mu” from Sinmumun Gate, the northern gate of the palace. As President Yun Bo-seon was sworn in following a 1960 popular democratic uprising against Rhee’s prolonged rule, he changed the name of the presidential residence to Cheong Wa Dae ― the house of blue roof tiles that symbolize peace ― as Gyeongmudae bore the negative public image of a long-reigning dictatorial ruler. The basic structure of the presidential complex took shape during former President Park Chung-hee’s 18-year rule. He built a series of presidential facilities including ceremonial venues, dining facilities, rooms for receptions, official conferences and press meetings and buildings for security staff. During his presidency, calls persisted for changing the name of the presidential office to “Hwangwadae” or the house of yellow roof tiles. Some argued that emperors in history wore yellow costumes and their palace was topped with yellow roof tiles. But Park rejected such calls as he was opposed to changing the name of the crucial presidential site so often. As the country’s global recognition increased with its economic growth and successful hosting of the Summer Olympics in 1988, President Roh Tae-woo paid more attention to sprucing up his residence and office. The renovation work also came as the Seoul government realized the lack of facilities to accommodate foreign leaders and their delegates when an increasing number of them came to Korea for state visits. The presidential press center of Chunchugwan was built at the entrance of the complex in May 1989. The main building housing the presidential office was built in 1991. 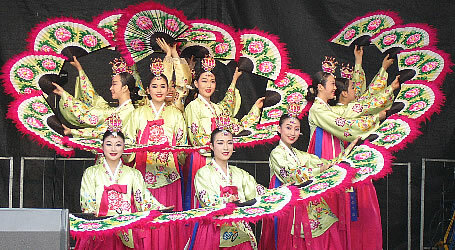 It stands in the line that links Mount Bukaksan, Gyeongbok Palace and the Gwanghwamun Gate, adding to its majesty. Following a North Korean assassination attempt on former President Park in 1968, access to Cheong Wa Dae was blocked for decades. But as access to part of the presidential district has been granted since the early 1990s, the complex has been one of the capital’s most popular sites bustling with tourists. During the presidency of Roh Moo-hyun, most of the areas surrounding Cheong Wa Dae including some major hiking courses along Mount Bukaksan were opened to the public. Observers say the opening reflects the progress of Korea’s democracy.